2013 has been a quite busy year for many IM app developers as we saw the evolution of personal messaging apps through out the year-WeChat, Line, WhatsApp, BBM™,Facebook Messenger and many more. But we have simply picked up the top 3 of them and expect them to be in our list next year. 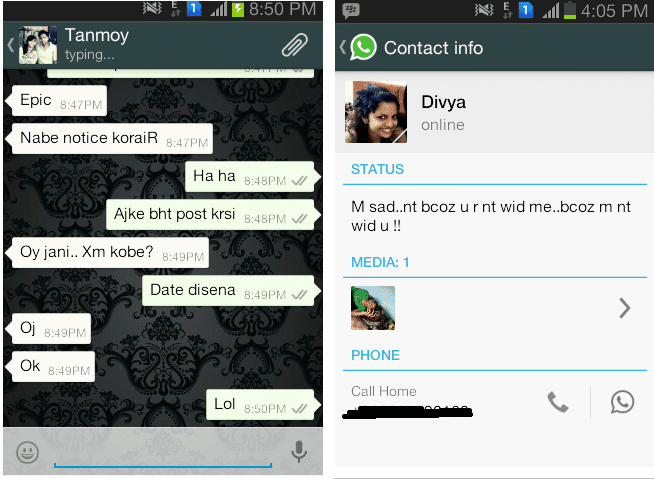 So let’s take a look at those amazing apps who killed the SMS. Whatsapp has been always popular all over the globe due to its fast service, simplicity and media transfer capabilities. But this year they added another cool option- voice messaging. Just press and hold the hold button, talk and release. The voice will be delivered withing a few while. The best features that many other messengers don’t have is the ‘last seen’ option. You can know when your friend came online for the last time. They have also made a lot of improvement and easy payment options also. Though, who pays? I’m using WhatsApp on same number for the last 3 years, but they did not charge me even a cent. And I think it should be at #1 because its a cross platform app-from the old Symbian to the latest iPhone it can work everywhere. BBM has been always a boss in case of instant messaging. Many people even buy Blackberry just for experiencing the lightning fast messaging and high security and this year BBM™ came to Android and iOS. And it just spread like what I can say like a “wildfire”. Everyone was sharing their pin and asking their friends to add them. 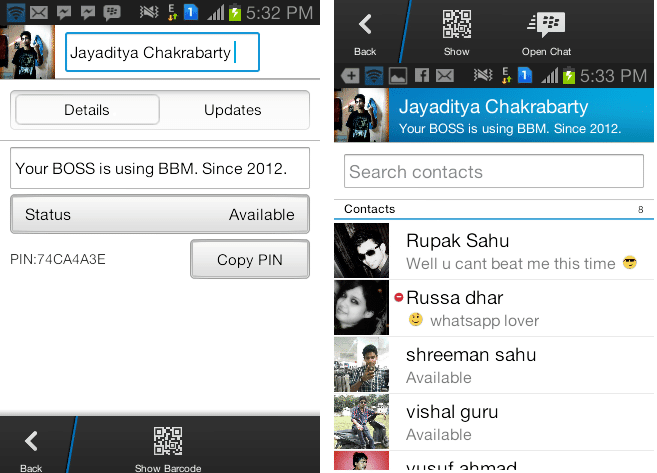 for me BBM™ was not a new thing as I used Blackberry, but when I installed it on Android I felt that the UI on Android was much better than that of Blackberry and it also has various options like smileys, symbols to understand whether a message is ‘delivered’ or ‘read’ and one option particularly I love a lot-PING. Though it became very irritating for me when people started pinging me as many times they can after installing BBM™ on their phones. Therefore, i think it deserves to be at 2nd position, just because a miss in one criteria- it is not available very widely. Even on Android, it runs only on Android 4,0 or above. 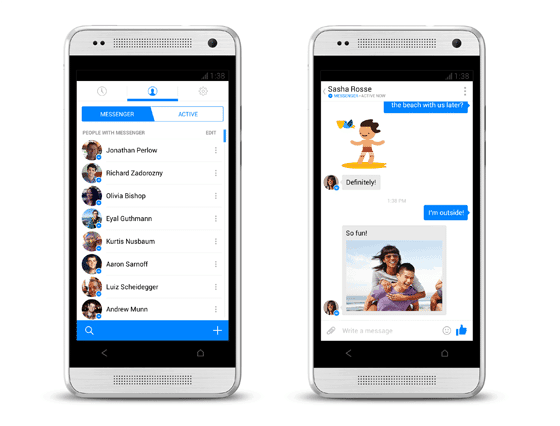 AT the end of the year, we can say at the last moment facebook released an amazing update which made facebook messenger faster, smoother and they added an excellent option. You can chat on facebook or else you can register your phone number with messenger and text your friends who are one messenger. That gives a flexibility and the freedom to go offline when you get irritated but wish to chat endlessly with your buddy. They fixed some bugs, changed the UI to a more stylish, elegant one and gave the freedom to use it as a social IM or personal IM. So, considering the last moment improvements, I’m ranking it at 3rd. Though there are a lot of other messaging apps like Kik Messenger, WeChat, Line etc. yet in case of the functionality and its main purpose I think one of these three can satisfy your needs. May be in 2014, we will get to see more crazier features on these messengers. So, wait for another exciting to come. Till then, bye bye.